The tongue is an instrumental and vital part of our daily life. It is often hailed as "the strongest muscle in the body", as it is made up of a group of muscles that is attached to the floor of the mouth. The tongue allows us to taste food, swallow and talk, and it can actually be a very good measure of the well-being of the body. Because we use our tongue constantly, it can be frustrating and uncomfortable when we experience tongue diseases, including soreness or swelling, changes in taste or color and pain. Many of these problems are not serious and most can be resolved quickly. However, in some instances, a discolored or painful tongue can indicate more serious conditions, such as vitamin deficiencies, AIDS, or oral cancer. For this reason, it is important to seek medical advice if you notice any annoying problems with your tongue. A healthy tongue is pink and moist; sometimes, it may have a thin white coating on the surface. The top of the tongue is covered with small bumps called papillae. The majority of our taste buds sit on these papillae. There are some variations of surface texture that are considered normal and healthy as well. What causes tongue problems ? 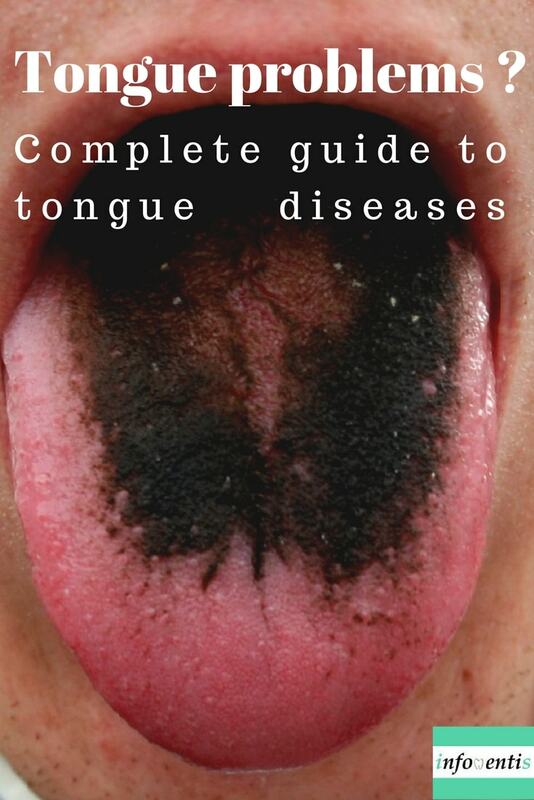 A variety of causes may lead to tongue diseases. Depending on the tongue problem, risk factors may include smoking, drinking alcohol, poor oral hygiene, viral infections or a weak immune system. Some individuals are born with a tongue condition that is harmless while other tongue problems can be injury related. Additionally, a tongue problem may be a result of an underlying medical condition elsewhere in the body. Oral thrush, also known as candidiasis or candiasis, is a yeast infection that develops inside the mouth caused by a type of fungus called Candida. The condition causes white patches to develop on the surfaces of the mouth and tongue. These patches are often cottage cheese-like in consistency and can be scraped off, exposing a red surface. Patients may experience a loss of taste or an unpleasant taste in their mouth. The patches can also be painful, making eating and drinking difficult. If you think you have oral thrush, see your doctor right away. If left untreated, the symptoms will persist and your mouth will continue to be uncomfortable. Oral thrush is normally treated with antifungal medication, in the form of a gel or liquid that is applied directly inside of your mouth. The treatment usually takes 7 to 14 days. Leukoplakia is a condition that causes cells in the mouth to grow excessively. This leads to the formation of white patches inside the mouth and on the surface of the tongue. As opposed to oral thrush, the white patches cannot be scraped off. The causes of leukoplakia are not always known, but tobacco use is considered the most common factor that contributes to leukoplakia. In addition, leukoplakia can develop when the tongue has been irritated in the near past. Leukoplakia is usually benign and not dangerous on its own. Nevertheless, leukoplakia can be a precursor to cancer. Therefore, it is important for your dentist to determine the cause of white patches on your tongue. Oral lichen planus consists of a network of raised white lines on the tongue and inside of the cheeks with a lace-like appearance. The causes are not always known, but it is generally considered that lichen planus is a chronic inflammatory condition caused by an autoimmune response (the body's immune system attacking its own tissue). Although regular monitoring of this condition is recommended (in rare cases, the condition can lead to oral cancer), it usually gets better on its own. Some general measures may also help: proper dental hygiene, quit smoking and cut back on foods that irritate your mouth. Vitamin deficiencies, such as deficiencies of folic acid and vitamin B-12 may cause your tongue to take on a reddish appearance. In some instances, the tongue may even take on the appearance of a strawberry with enlarged, red taste buds. Other conditions that can cause a red tongue include Scarlet fever and the Kawasaki syndrome (a disease that affects the blood vessels in the body, usually seen in children under the age of 5). In any of these situations, it is advisable to see your dentist or your GP as soon as possible. 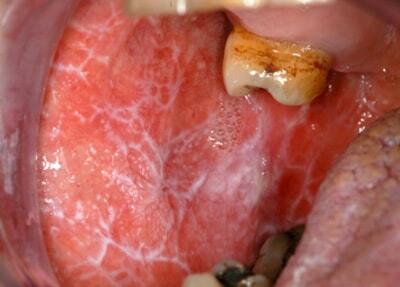 Geographic tongue (or benign migratory glossitis) is one of the most common tongue conditions. It is named for the map-like pattern of reddish spots that develop on the surface of the tongue. The patches can vary in size and, at times, they may develop a white border around them. The red spots may shift their location as they may occur on one area of the tongue before moving to another area after a few days, weeks or months. The condition is usually painless, although, in some people, the patches can feel sore or sensitive when consuming certain foods and drinks. As a general rule, you should check with your dentist to investigate red patches that last longer than 2 weeks. If the dentist has determined that the redness is a result of geographic tongue, no further treatment is generally indicated. However, if the condition makes your tongue feel uncomfortable, you may be prescribed topical medications to ease discomfort. Erythroplakia is a red area or lesion that cannot be rubbed off that appears on the surface of the tongue. Except for the color, it is similar to leukoplakia. Erythroplakia has an increased risk of cancer compared to leukoplakia. Therefore, a biopsy is recommended by an oral surgeon to rule out oral cancer. Generally, a black hairy tongue is nothing serious. Apart from the appearance, the condition is harmless and it typically causes no pain. The small bumps on the surface of the tongue are called papillae. In some people, the papillae become excessively long which makes them more likely to harbor bacteria. When these bacteria grow, they may look dark or black and the overgrown papillae appear hair-like. It is considered that one of the main causes of this condition is the change in the normal bacteria in the mouth after antibiotic treatment. Other risk factors include a poor oral hygiene, smoking, diabetes or a dry mouth. Treatment may involve improving the diet, quitting smoking, and improved oral hygiene (including gently brushing or scraping the tongue). If you bite your tongue, you may develop a sore that can last for days and be very painful. Inflamed papillae, or taste buds, may also appear due to an irritation from hot foods. This can also result in a sore tongue until the damage heals. Grinding or clenching the teeth can irritate the sides of the tongue and cause it to become painful. A canker sore is another common cause of pain on or under the tongue. Canker sores (also known as aphthous mouth ulcers) can occur anywhere in the mouth but are more common on the underside of the tongue. They appear as a yellow-white round or oval, sometimes with a red halo. Although no definitive cause has been found yet, some possible causes are mouth injuries (such as accidentally biting your tongue), abrasive ingredients in toothpaste or mouthwashes, food allergies or nutritional deficiencies. Ulcers that keep recurring may be caused by stress and anxiety or hormonal changes. Canker sores, unlike cold sores, don’t occur due to the herpes virus. Canker sores usually go away without any treatment in one to two weeks. In the meantime, it is advisable to avoid anything that makes the pain worse, such as eating spicy foods or drinking hot beverages. You should see your GP or dentist if the sore doesn't improve within a few weeks or you develop ulcers regularly. Burning tongue syndrome: Some postmenopausal women develop this syndrome, which makes the tongue feel as if it has been burned. Other symptoms include increased thirst with the feeling of a dry mouth, as well as an altered or metallic taste. Oral cancer usually causes pain in the latter stages. Therefore, you should always consult a doctor if you have a lump or sore on your tongue that doesn't go away within a week or two. Remember, many oral cancers don't hurt in the early stages. Oral herpes is caused by the herpes virus and appears as fluid-filled lesions. It can occur anywhere in the mouth. These lesions usually heal in two or three weeks; oral herpes can also be treated with antiviral medications to shorten the duration of symptoms. Certain medical conditions, including diabetes and anemia, can have a sore tongue as a symptom. Irritating dentures or braces can cause temporary pain until the situation is resolved. Neuralgia causes a very severe pain that occurs along a damaged nerve. Neuralgia occurs for no obvious reason, or it can occur due to aging, multiple sclerosis, diabetes, tumors or infections. When the tongue swells very suddenly, the likely reason is an allergic reaction. Allergic reaction to medications, food, or even a bee sting can cause swelling of the tongue, which can result in difficulty breathing. If this occurs, you should get medical help right away. A swollen tongue may be a symptom of a disease or medical condition, such as Down syndrome, tongue cancer, an overactive thyroid or leukemia. Tongue swelling can also be a side effect of medication. For example, some medications used to treat high blood pressure (ACE inhibitors) or nonsteroidal anti-inflammatory drugs can have this side effect. An injury from hot food or liquid that burns the tongue, or simply biting the tongue can irritate the tongue to cause swelling. Local conditions, such as oral thrush or oral herpes can also cause the tongue to swell due to inflammation.